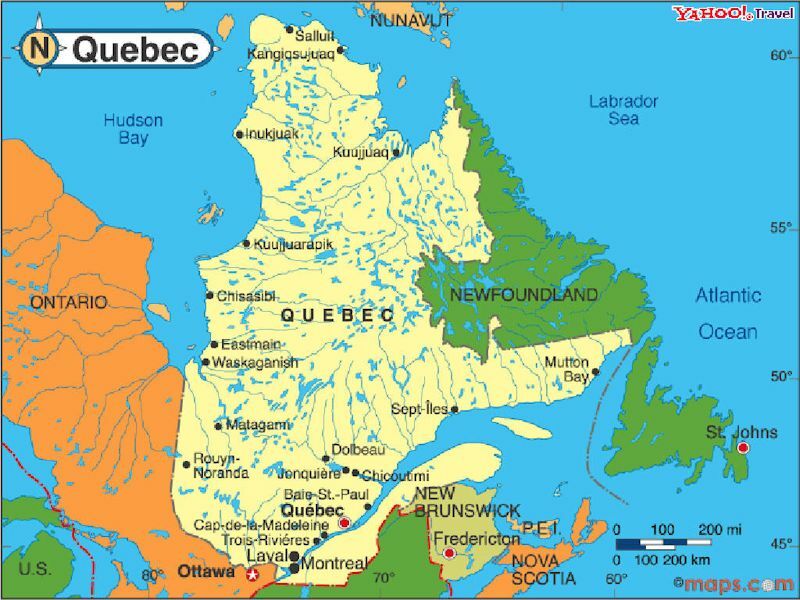 Quebec is one of Canada's ten Provinces. It is the largest in size and has the second largest population. Its northern borders are two bodoes f water the Hudson Bay and Labrador Sea. To the south ot borders on Ontario (sw), NewBrunswick (sE)and the USA states of New York, New Hampshire, Vermont and Maine. To the west is Ontario. It's two main cities are Montreal and Quebec City. To the east Newfound Labourdor is its neighbour along with the Atlantic Ocean. It's two main cities are Montreal and Quebec City. The St Lawrence River a major shipping route runs from the Atlantic to the west of Montreal. Approximately half of Quebec residents live in the Greater Montreal Area, including the Island of Montreal. French is a majr language within the province. Quebec is also a major player in several leading-edge industries including aerospace, information technologies and software and multimedia. Approximately 60% of the production of the Canadian aerospace industry are from Quebec. The pulp and paper industries generate annual shipments valued at more than $14 billion. Quebec is remarkable for the natural resources of its vast territory. It has about 30 mines, 158 exploration companies and fifteen primary processing industries. Many metallic minerals are exploited, the principals are gold, iron, copper and zinc. The wine industry is relatively small it must over come harsh winters and the wide grape between the few quaility produces and those that make wine as a side line.The St. Lawrence river valley, south of the province, is a fertile region where wild grapes and other fruits grow naturally and abundantly. However, the four-month-long winter of this humid continental climate zone freezes the land deep enough that most varieties of European vines do not survive. In the 1980s, Quebec wine growers started planting varieties known for their resistance to below-zero temperatures and in certain cases made use of modern techniques to heat up the soil during the coldest days of winter. Quebec wine makers have 6 months to accomplish what in warmer wine regions takes 11 to 12 months to do. Please see Wines of Quebec. The wine producing regions of Quebec.